Jan Saenredam (b. Zaandam c. 1565, d. Assendelft 1607) was a Dutch engraver, draughtsman, and mapmaker. Saenredam’s style was greatly influenced by the work of Goltzius, whose fascination with nature and outdoor sketching inspired naturalistic scenes that differed from the sixteenth century emphasis on idealism. 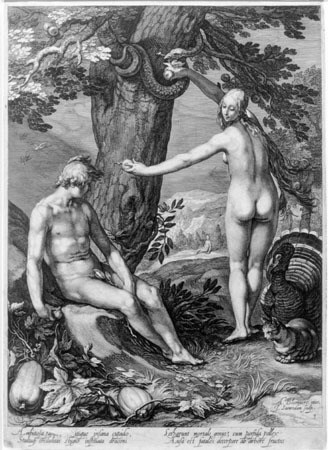 Saenredam engraved The Story of Adam and Eve in 1604 in a series of six prints on view at UAMA. The series is based on Abraham Bloemaert’s paintings of the same theme, but unfortunately images of the original Bloemaert series are difficult to find. In some cases, copies by other artists exist. From these examples, we know that Saenredam maintained an independent artistic style. The Story of Adam and Eve was printed during a tumultuous time in Netherlands history, as Protestants and Catholics battled for political control. Bloemaert, upon whom these images are based, was a known Catholic; Saenredam’s religion was most likely Protestant. The exhibition of six prints was curated by Anna Walcutt, a UAMA 2010/2011 Curatorial Intern, under the direction of Lauren Rabb, UAMA Curator of Art.